Purchasing online seems to be the easiest and most convenient way to shop. Online stores such as Alibaba.com and Aliexpress.com provide a variety of products big and small. These two websites are under the Alibaba Group with headquarters in Hangzhou, China. It is founded by the executive chairman, Ma Yun or popularly known as Jack Ma. Since they are both under the umbrella of the Alibaba Group, there are still distinctions between the two online stores. If you are asking if Aliexpress is the same as Alibaba, the answer is yes and no. Yes, in a sense that they are both online stores and no because there are a lot of differences between the two websites. Alibaba is the principal platform for international wholesale industry proving different merchandise to buyers and suppliers globally. Majority of the members here are manufacturers, resellers, or manufacturing companies who buy and sell order quantities in large volume. Aliexpress, on the other hand, is a worldwide retail marketplace that provides a few excellent products at factory prices. You can even purchase here just a single item and can pay with caution with the Buyer Protection service. 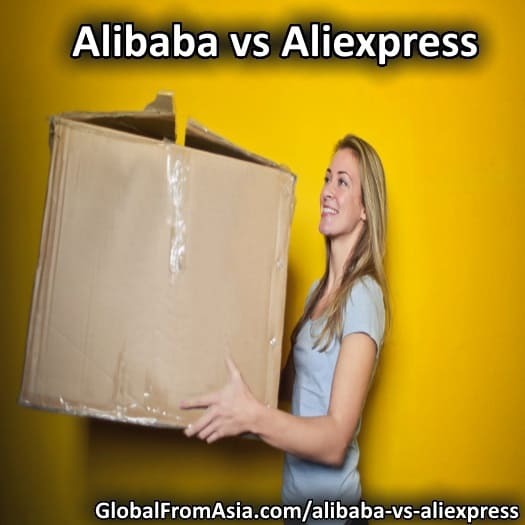 So, what are the differences between Alibaba and Aliexpress? Alibaba and Aliexpress have a lot of differences when it comes to the order quantity, pricing, trade design and branded merchandise, merchandise accreditation, quality glitches and liabilities, and lead times. At Alibaba, suppliers prefer to have a higher Minimum Order Quantity (MOQ) because products are not kept in stock. There is a need to buy a minimum volume from the suppliers. Manufacturing a minimum number of products is a must with the aim of making a profit. Suppliers for Aliexpress offer units ranging from 10 and above for the MOQ. This is so because they can separate larger quantities between several small customers. This could cut the problem of arriving at having high MOQ demand but could somehow affect the prices. Although Alibaba has no fixed prices, everything is detailed from scratch to different standards. After supplier reviewed the sent product descriptions (colors, designs, sizes, etc. ), delivery terms as well as the quantity, he will respond with a price. The more you order, the bigger discounts you will have. With Aliexpress, the supplier notes a product and amounts for various quantities. Prices here are comparatively higher compared to the higher bulk orders from Alibaba suppliers. Majority of Alibaba suppliers provide custom designs as well as logo printing. But building a new product out of nothing is hard, and specifications for a well-drafted product are necessary together with the graphical material. These consist of components, logo designs, product packaging designs, material specifications, product body artwork, and Pantone colors. Aliexpress products are already available and just waiting for buyers. Since a few units cannot be returned to the factory for modification of its design and logo, it is not advisable to look for custom-designed products here. Most of the products sold online are toys, gadgets, food, and others should comply with different product certificates such as CE, RoHS, EMC Class A and B (Electronics), EN71 (Toys), REACH (Plastics), and FR B1 and B2 (Fire Retardant). Alibaba suppliers offer “made to order” products and buyers can request products that comply with the certain accreditations with the use of certified materials and ingredients. The products offered on Aliexpress are on hand without any assurance that these are made with the compliant materials. Compliant products are a bit costly, and suppliers will become less competitive to their buyers composed of African, Latin Americans, and Russians. Importing China products has its own risks and different industries become watchful regarding fraud deterrence and quality assurance. From the smallest details that do not conform to the final product become a probable deception. It will take a couple of hours in asking the suppliers at Alibaba regarding their manufacturing competencies. The quality of the products is at greater risks while product specifications cannot be determined. Here, it is best to know the product to avoid quality issues. At Aliexpress, ordering is not that complicated and you acquire what the suppliers provide. Take note that quality is prejudiced and ordering a sample would be best before placing a bulk order. Products that are considered to have a good quality might be the same when sold to other countries. Feedback is also provided at Aliexpress where consumers can view reviews and based on what they read can make their decisions if they will buy the product or not. If you plan to import from China, you must consider the importance of time. You must always remember that time is money. Before making your purchase from a Chinese manufacturer, consider order preparations, production time, and shipping time. Identifying the right suppliers at Alibaba can take months, and this includes the definite product samples, bargained prices along with the hard copy of a signed and stamped Sales Agreement. You can likewise request an incidental manufacturer to send you a digital invoice to transfer your funds but is absolutely risky. The products offered in Aliexpress are readily available and out for delivery. This is an advantage on the part of the buyer since he need not worry about the time and order preparations. The only thing to consider here is the air freight delivery time. It is a business to business or B2B platform that links manufacturers, mostly Chinese with international buyers. There is no integrated shopping cart system, and the terms of the order are negotiable. It is confirmed by email or via chat. There will be no transaction fees involved or paid commissions. Earnings come from the fee paid under the “Gold Supplier” membership. Each Gold Suppliers are verified, but it doesn’t mean that the products they offer are of high quality. It is dedicated to a modest quantity of available products instead of those that still need manufacturing. This is more advisable for small and medium-scale importers who don’t have the means to purchase storage of goods. It has a Minimum Order Quantity (MOQ). Suppliers have to produce a specific number of goods before he could earn. The suppliers of the component and raw materials carry out MOQ requirements on your supplier. This is a must because they also have to give a specific number of products to your supplier for them to gain profit. If this cannot be achieved, the tendency is the supplier will not do any business with you. These facts and comparisons might have answered your question “ Should I use Alibaba or Aliexpress”? It is up to you since Alibaba and Aliexpress have a different approach that can cater to your needs, wants, and budget. Totally agree, everything depends on what we need and so that we need it, so we will know if we should buy in bulk on Aliexpress or buy wholesale on Alibaba.